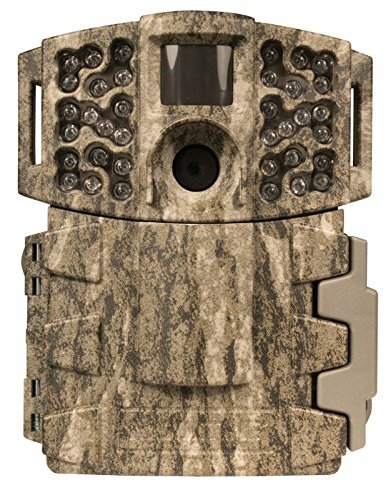 Coming forward with the latest and most stunning advances in camera technology, the Moultrie M-888 Mini Game Camera Mossy Oak Bottomland is designed to provide users with the best quality of photos and videos for wildlife documentation. Despite its smaller size compared to other cameras in the market, buyers can be assured that the quality and durability of the camera is never compromised. Presenting photos and videos in high-resolution and full-colored quality, the Moultrie M-888 Mini Game Camera makes this possible through its 14 MP camera quality. Coming with a trigger speed of fewer than 0.7 seconds, you can capture up to 17,000 images during the entire maximized time of usage. Its flash can illumine up to a distance of 100 feet while its detection feature can sense movement and heat of up to 50 meters, allowing you to see and capture movements from distances which are hardly seen by the naked eye in a clearer and brighter view. You can adjust the photo resolution of the camera in accordance with what you wish to have or what you are required to capture. Options for different image resolutions include 2MP, 4 MP, 8 MP and of course, the default 14 MP. You can view the images and videos taken through a screen measuring 16×2 inches TN Display powered by Orange Backlight. Images can also be captured with this mini game camera through multiple shots and burst shots—where you can choose to have three triggered shots or three burst shots. Helping the users more with the wildlife documentation process is the mini game camera’s photo stamp feature. This photo stamp feature imprints details such as time, date, temperature, moon phase and other helpful information about the photo. This feature can be turned on or off depending on what the user wants or needs to have for the documentation process. Like most of the trail or gaming cameras in the market, the Moultrie M-888 Mini Game Camera runs on 8 pieces of AA batteries which can help the camera stand by its own for quite long time regardless of the resolution chosen by the user. On top of these features, the camera features a Mossy Oak Bottomland camo case which offers a good camouflage feature to the camera unit itself when strapped with the trees of the wild. This camo case is already included in the package upon purchasing this camera. With its amazing camouflage feature and waterproof characteristic, your camera can be secured from unintended nuances. Its fast trigger speed will allow the consumer to capture not only a single movement, but multiple shots which can be used for comparison and thorough observation. With a flash distance of 100 feet, you can already capture even the most elusive of animals in the wild. This flash distance is way beyond the common ones found in other competitor cameras in the market, mostly detecting only 80 feet away from the camera. The adjustable image resolution provides users with plenty of options on how elaborate or clear an image or video can be. Plus, it can also be advantageous for those who are trying to save up memory space without compromising the quality of their visual documentary basis. The camouflage camo case provides a good security feature since it blends well with its environment full of trees. Considering this, you are entitled to have a more natural view of the life in the wild while having confidence that it will not easily be visible and stolen from where you have set it up. The camo case offering the waterproof feature of the camera is also a good assurance for the user that no matter the weather, the camera will still function and will not be in danger of getting broken. The great disparity between the flash range and the detection range could put the user’s images and videos at a disadvantage. This is because even if the camera can lighten up the scenery from 100 feet away, it would be useless if it can only detect movement from half of the said distance. This might also just cause animals from that distance who will see the flash to be startled and might even cause chaos in that area. Also, given the absence of its features which could have helped the camera adjust to the darkness, you cannot have much of a guarantee that night photos taken using this mini game camera will be of the same impeccable quality as the ones taken in the morning or afternoon. The only redeeming feature that can compensate for this is the 50-meter reaching flash. Though it could compensate for the lighting feature, the quality is still at risk as depending on the flash feature alone could result in white overexposed photographs. This camera will serve its purpose well for those who want to have the best photographs and videos taken in the morning. This camera might not be the best option for night photos but will still serve its purpose well by the time the sun shines. Also, this product is recommendable for those who are looking for a camera that has many flexible features to adjust to the demands of their wildlife documentation in terms of photo quality, the memory occupied and details needed.